He took Britain into the ill-fated conflicts in Iraq and Afghanistan. 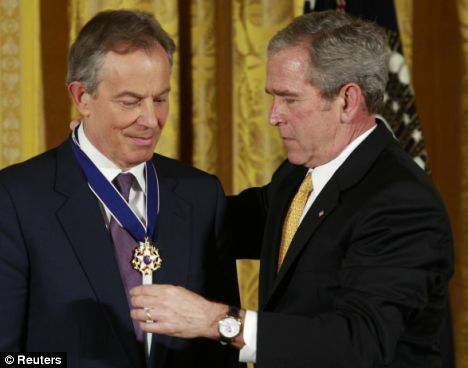 But last night Tony Blair was honoured in America with a medal, £64,000 prize and a banquet - for his services to peace. He cancelled a planned book signing in London last week after eggs and shoes were thrown at him at an earlier book signing in Dublin. Protesters were angered over his role in launching the Iraq War. There were no protests at the Philadelphia ceremony, which featured a performance by The Irish Tenors and a video tribute from U2 lead singer Bono, a 2007 recipient. Mr Blair was given a glowing tribute by former U.S. president Bill Clinton who called him a 'wonderful citizen of the world' and a personal friend. 'This is in recognition of his work as prime minister and after putting peace and prosperity at the the forefront of his life in the uk and far beyond it's borders, he said. Mr Clinton also praised Blair's 'extraordinary political skill' and said should he bring peace to the Middle East it would 'do more to drain the swamp of terror... and undermine the siren song if terrorists' than anything else. Mr Clinton also defended the former prime minister from his critics: 'The best you can ever hope for is to have had a positive record, because everybody makes mistakes'.